It's here, last hours of a great offer from Crocs Canada are ahead of us. 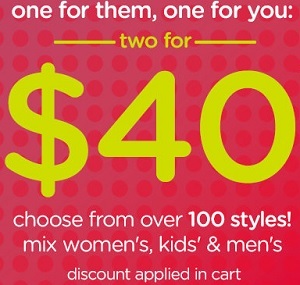 Enjoy this offer: one for them, one for you, buy two for $40. You can choose from over 100 styles. Mix women's, kids' & men's. The offer is valid online only on the official website. Discount is applied in cart. Official source of the information is Crocs Canada. Offer expires today (12/16/2015). For more detail about the promotion visit the official website.